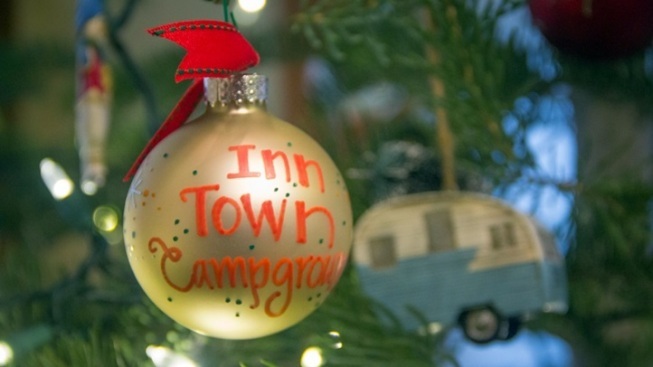 The Inn Town Campground welcomes holiday-happy vacationers. CAMPGROUNDS + COOLER DAYS: Here's something true that can't be quibbled with: Even when snow arrives, and brisk breezes blow through, the summery places we love and adore still stand. Swimming pools don't simply pack up their luggage and make for sunnier climes, and beaches known for hot-weather vacationers don't roll up all of that sand and stick it in storage. Likewise, campgrounds, those play places of May, June, July, August, and beyond, absolutely don't get their goodbyes on when the first flakes start to fall. True, some may temporarily shutter, or keep a different schedule, but they're still right where summer lovers left them. WILD & SCENIC FILM FESTIVAL... in January, and Nevada City's charming Victorian Christmas (a December staple, on select afternoons and nights). The tents have been stowed at the Inn Town, do note, but if you have a motorhome or RV you can reserve a spot in the heart of January or February. The campground also has suggestions on where to rent an Airstream or Teardrop trailer, the kind of old-school roll you've been vowing to try out for years. And shall there be s'mores kits just in time for the yuletide, with artisanal marshmallows (think peppermint bark)? The campground owners want to bring some festiveness to their guests' goodie-based cravings. To check out all of the wintry haps in Nevada City, and how things change slightly at the campground over winter (though not too much), give the Inn Town a buzz. Then start packing some of your warmer, downier wear, for a summer-style adventure in the heart of the winter's beautiful brrrr.